I get a lot of questions here about church records. And probably nothing in Rhode Island is more complicated and interesting than church history. The first thing I think people have trouble realizing is that the church your ancestor belonged to prior to 1850 probably doesn’t exist anymore. And if it does, it is focusing on its mission today and not necessarily devoted to looking up old records, or even in possession of old records. I’ll bet there are some exceptions to that, but then again, I wouldn’t know, I’m embarrassed to say my New England ancestors barely darkened the door of a church between about 1700-1900 so I don’t have much to look for. The other thing that’s important to understand is that since many of these churches were, in their time, new and unique, it’s important to do more than race around looking for vital records. It’s important to understand what the church philosophy and principles were. For instance, your ancestor from one part of the state may have found a bride from a completely different area of the state, or into Massachusetts, because marrying within the church was required. Other rules may have impacted your ancestors’ lives: refusal of military service, baptism of infants (or Baptism of adults), or consequences of non-attendance. Knowing the story of the church will tell you something significant about your ancestors’ story. I am no expert on this, so feel free to add, in the comments, your own favorite sources for church records. First Congregational Meeting House, Providence. The history of the state of Rhode Island and Providence Plantations, Volume 2, p. 564. During the Depression, the Work Projects Administration (WPA) put some people to work compiling the locations of old church records as part of The Historical Records Survey. These books will guide you to the LOCATION of church records in the 1930’s. They do not contain the records themselves. In many cases a name and address will be given for a person who was holding the old record volumes (around 1940). Those would be useless today. In some cases, a repository or association is mentioned as holding the records. That might be something you could follow up on. Inventory of the Church Archives of Rhode Island. Society of Friends. Providence: Historical Records Survey, 1939. Inventory of the Church Archives of Rhode Island. Baptist. Providence: Historical Records Survey, 1941. A view in 1827 of all the Six Principle Baptist Churches in Rhode Island is contained in History of the General or Six Principle Baptists in Europe and America by Richard Knight, p. 254-301, specifically. Weis, Frederick Lewis. Colonial Clergy of New England. Lancaster, Mass. : Society of the Descendants of the Colonial Clergy, 1936. First Baptist Meeting House, Providence. The history of the state of Rhode Island and Providence Plantations, Volume 2, p. 564. Updike, Wilkins. A History of the Episcopal Church in Narragansett, Rhode Island (1907): Volume 1. Volume 2. Volume 3. Members of the Coventry Church of Christ 1824-1897 transcr. by Margery I. Matthews. Rhode Island Roots 27:3 (Sep 2001 – note page displays 2000 in error) p. 93-130. Arnold, James N. Vital Records of the State of Rhode Island v.7 (opens the pdf link to the Internet Archive download, or, browse book online and download from this page). Central Congregational Church. The history of the state of Rhode Island and Providence Plantations, Volume 2, p. 586. Arnold, James N. Vital Records of the State of Rhode Island v.8 (opens the pdf link to the Google Books download, or, browse book online and download from this page). Arnold, James N. Vital Records of the State of Rhode Island v.10 (opens the pdf link to Family History Books (familysearch.org) for immediate download download). Arnold, James N. Vital Records of the State of Rhode Island v.11 (opens the pdf link to the Internet Archive download, or, browse book online and download from this page). St. Peter’s and St. Paul’s Cathedral, Cathedral Square, Providence. The history of the state of Rhode Island and Providence Plantations, Volume 2, p. 616. The Rhode Island Historical Society does have some holdings of church records (not always member data, though) so check their card catalog as well as contacting them with questions. I suspect the same is true for the Newport Historical Society Library. The New England Yearly Meeting of Friends archive. archives of the First Baptist Church in America (permission from church historian needed, see web link above). Probably the best sources of any new research that might come along on this topic from time to time would be Rhode Island Roots from the Rhode Island Genealogical Society and Rhode Island History from the Rhode Island Historical Society. I enjoy belonging to both those organizations and receiving the subscriptions. To search back issues of Rhode Island Roots see the instructions on the RI Genealogical Society website. You can search Rhode Island History here. A list by noted genealogist Jane Fletcher Fiske found on the Rhode Island section of Rootsweb: Bibliography of Abstracted Church Records. Some Episcopal (Anglican) Church records in Rhode Island are housed at the University of Rhode Island Library. The Rhode Island Jewish Historical Association Notes. Older issues can be found on the association’s web site. The association has a library in Providence with some useful holdings. Rhode Island Jewish Historical Association Notes, photo by Diane Boumenot at the Family History Library, Salt Lake City. Rhode Island Archival and Manuscript Collections Online (RIAMCO) Advanced Search may yield some results. Despite the name, only the search screen is online, the results usually point you to paper archives at various locations in Rhode Island. The Narragansett Historical Register seems to have articles about a few churches. The Rhode Island Genealogical Register has a few church cemeteries, but a quick perusal shows no church records, which is just as well since this 20 volume periodical is hard to find. Under copyright, so not online, but no longer for sale in print. Available used and in libraries only. Rhode Island: Volume 5 of Bibliographies of New England History shows church materials in just about every town list; often an anniversary souvenir booklet, not, usually, materials with member lists. This book (University Press of New England, 1983) could be consulted in large genealogy libraries or at local libraries in Rhode Island. Many of Rhode Island’s town histories will include the history of many of the local churches, for instance, Oliver P. Fuller’s 1875 History of Warwick, Rhode Island. Likewise, the larger statewide histories like Thomas W. Bicknell’s History of the State of Rhode Island and Providence Plantations include overviews of various churches and religious bodies (particularly Volume 2, p. 565-637). Volume 1 Volume 2. Volume 3. Volume 4:Biographical. Volume 5: Biographical. Academy of the Sacred Heart, Elmhurst, Providence. The history of the state of Rhode Island and Providence Plantations, Volume 2, p. 621. For many years Rhode Island has had a large Catholic population. Some Catholic Church records have been transcribed and published in book form. Check out the American French Genealogical Society website (including the book sale and the library catalog) for many of these volumes. The state Catholic Diocese is located at 1 Cathedral Square, Providence. Rhode Island Quakers in American Revolution 1775-1790. Providence Meeting of Friends; 1976. With fold-out map. 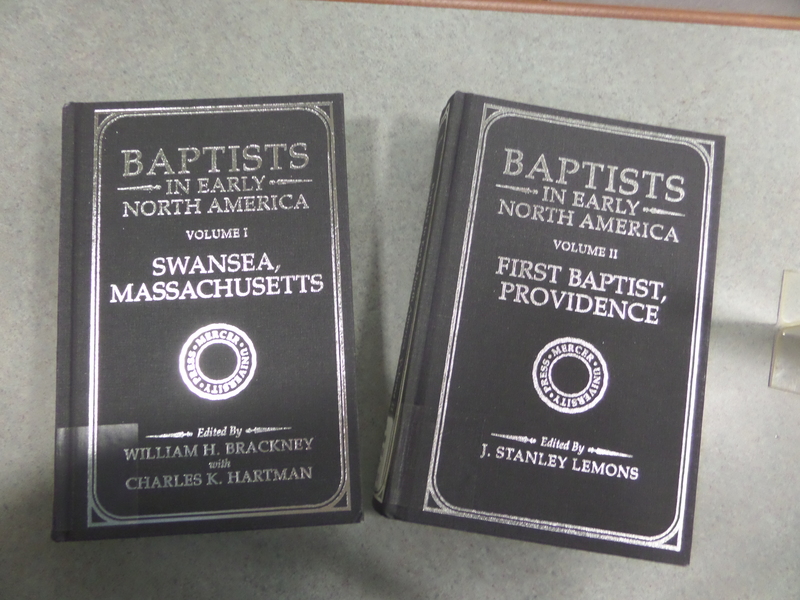 Two books have been released in the new series “Baptists in Early North America” – a volume on Swansea, Massachusetts, by William Brackney and Charles K. Hartman, and a volume on the First Baptist Church in Providence by J. Stanley Lemons. Both contain some early records, some wonderful footnotes, and a complete index. I spotted these recently at the New England Historic Genealogical Society Library. More sources will be added here from time to time.